From the beginning of time, sound has been one of the most powerful healers. When sound waves enter and pass through our body, it results in vibrational changes. Tuning Fork Therapy uses sound and vibration to assist your physical body's organs, tissues, glands, cells, etc to reach their optimal vibrational frequency (OVF) thus allowing them to self heal. It is also helpful for reducing stress, tension, and pain management. 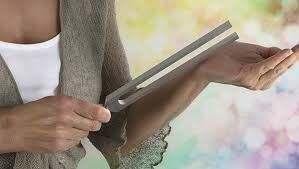 Tuning fork therapy can also be used for deepening a spiritual connection, increasing mental clarity/focus and balancing the mind, body, and spirit. Edgar Casey stated that sound (vibration) would be the medicine of the future. Tuning fork therapy draws upon the science of sound and ancient practices to create a harmonic holistic approach to health and well being. "There are places in the heart and soul only sound can touch."